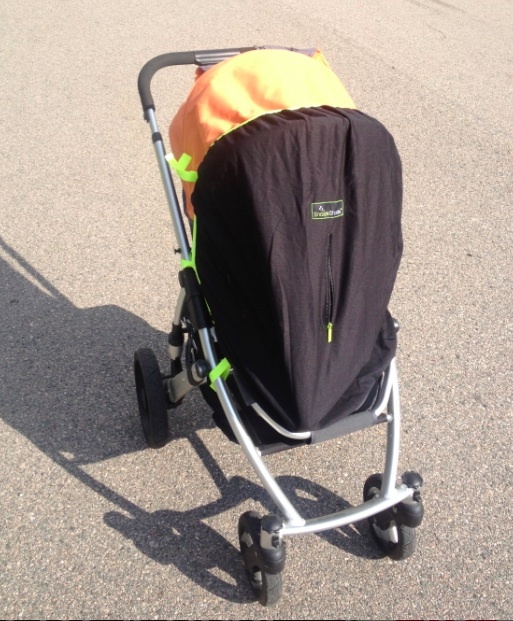 We had the chance to try out the SnoozeShade, a new shade that can go over most any stroller. We were nervous that she wouldn't like the feel of it over her, but she actually loved peeking through it and loved playing around in it! She wasn't afraid of being under it. She really likes to play with her toys in it and read books. She calls it her "tent". At first it may appear uninviting, like you're hiding your child, but once you get to use it you'll wonder why all strollers don't have this as an automatic accessory in the box. We use ours everywhere! You would think we would be concerned about it being too hot or not breathable, but it's made of breathable material and has a zip hole to open up. 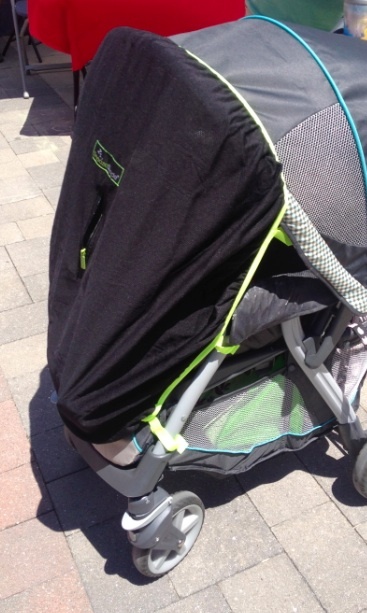 It is made of elastic material that will shrink to go around most strollers and velcro tabs to hook around the poles. We have two different strollers and it fit both easily! We really like that it blocks a bunch of the sun's ray's (UPF 50+) and will provide extra shade in the hot sun! The SnoozeShade folks also have a version made for cots/pack and plays in development. We are grateful that they gave us one to try and are going to give one away to our readers! Our favorite strolls are through Wompack State Park in Hingham! This looks like a great product! I just made a shade cover for my infant carrier but this looks more form fitting and easier to use. Last week, I used a blanket as a sunshade during a walk on Lake Quannaowitt and my toddler aged son took it off the baby's stroller. My son was running towards the lake with the blanket. I had to stroll the baby as fast as I could to catch up with my son. As he was about to throw the blanket into the lake, I felt a sharp pain at my ankle. I was stung by a bee! I scooped up my toddler (sadly, the blanket ended up in the water)and fished out the blanket from the lake and we continued our walk without any sunshade for the baby. When I got to the car, I tended to my ankle. That walk was a little bit more than I bargained for!